After a few hours from now, Saudi Crown Prince Mohamed Bin Salman aka MBS will arrive Cairo for a two-day visit as part of his current regional tour in the Arab world before his big international comeback at the upcoming G20 meetings in Argentina. That’s first regional tour for the crown prince since the assassination of late Saudi writer and journalist Jamal Khashoggi. It is a cheap PR tour to show that MBS is still in control and powerful among the Arab countries especially after the support he got from US president Donald Trump. There are few people who spoke up and did not welcome MBS in his big PR visit to Egypt. 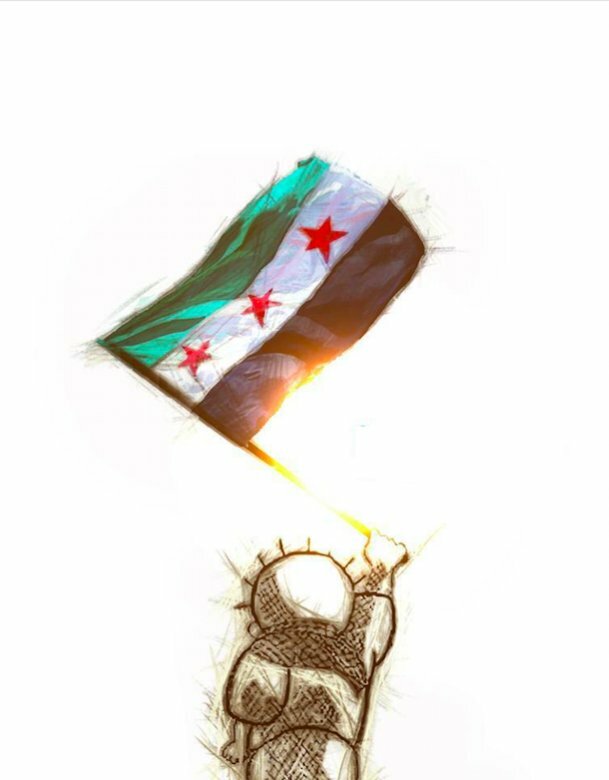 I have to highlight those people because the Egyptian mainstream media ignored them totally and I hope that the future generations not to blame us and wonder why nobody spoke up. Egypt’s left-leaning Civil Democratic Movement parties issued a statement not welcoming Prince MBS. The Civil Democratic Movement said in its statement it issued on Saturday after its meeting that it rejected his visit to Cairo saying “he is not welcomed in the country”. 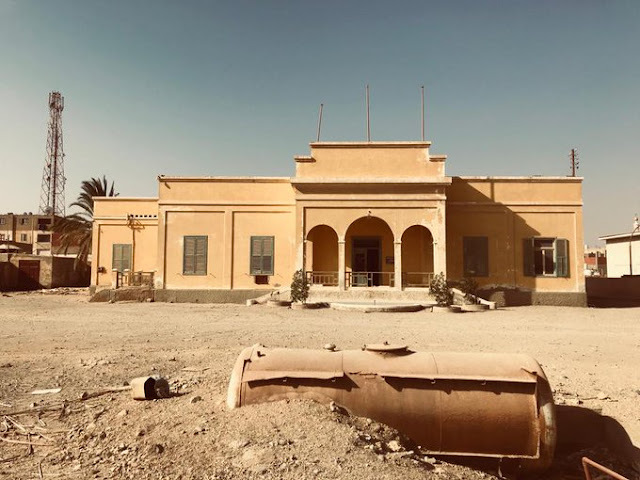 “The movement has not forgotten that he was one of the main architects of taking over Egypt’s strategic Tiran and Sanafir islands crime.” said the movement at the beginning of the statement reminding us with that painful unforgettable and unforgivable tragedy. The movement also lists what it believes crimes of the distinguished guest which the Egyptian Presidency issued a statement welcoming him Monday afternoon. The movement mentioned that his tour was an attempt to beautify his distorted image following the murder of journalist Jamal Khashoggi "which all the evidence available show that he ordered personally its execution"
The movement slammed "the rejected visitor" for his support to Israel quoting the recent statements of both Trump and Benjamen Netanyahu of Israel supporting MBS in the Khashoggi's crisis.
" MBS' biggest crime is the war of Yemen and the air strikes of the coalition led by his regime which resulted in the Yemeni people to have the biggest humanitarian catastrophe in its history," said the statement listing the famine, disease to the rest of the disaster Yemen is currently suffering from right now. Over 100 Egyptian Journalists from the members of the Egyptian Journalists syndicate issued a statement denouncing and rejecting the visit as well. The statement is published by Amr Badr, the head of the Freedoms committee in the Egyptian Journalists syndicate yet that statement does not represent officially the position of the syndicate. The statement says that MBS is not welcomed in Egypt for humanitarian, professional and patriotic reasons. From a humanitarian point of views, those journalists remind the world how Ben Salman and his regime do not respect any human rights whether for Saudi citizens or non-Saudi citizens in the Kingdom. When it comes to the professional reasons, the Egyptian journalists who signed the statement made it clear that they reject totally the murder of their colleague Saudi journalist Jamal Khashoggi. 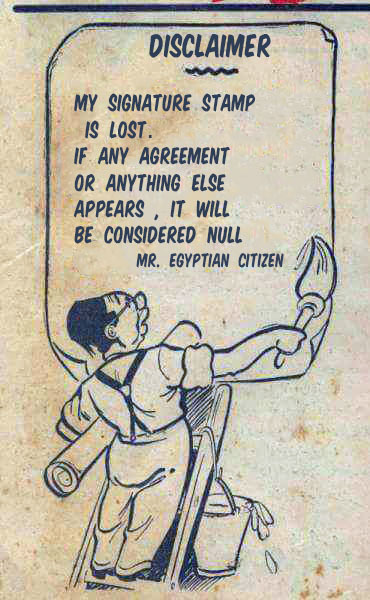 Patriotically, those Egyptians journalists also reject the US-Israeli support to MBS for sake of Israel reminding us that they have not forgotten Tiran and Sanafir islands. 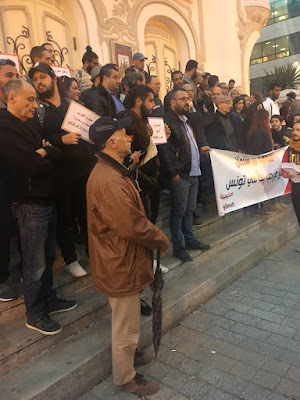 The Egyptian journalists called their syndicate to follow its sister Tunisian Journalists National syndicate in Tunis and to declare its rejection for the visit but Egypt is not Tunisia for real. Tunisian Journalists National Syndicate or the Syndicate National des journalistes Tunsiens”SNJT” is the only Journalists syndicate or union in the Arab world that declared officially its complete rejection for the visit. 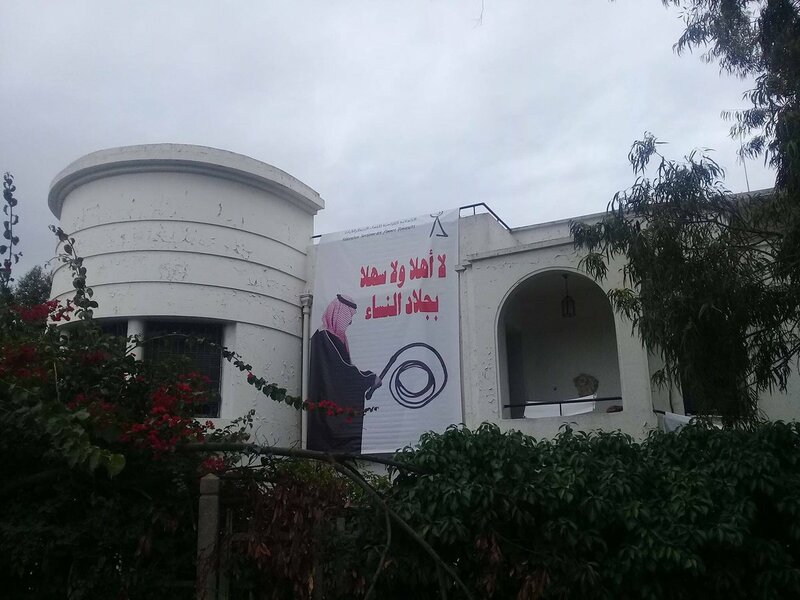 "You are not welcome Bin Salman in the land of Revolution Tunisia"
The SNJT official headquarters in Tunis "Twitter"
In an open letter to Tunisian President Beji Caid Essebsi issued on Friday, the syndicate asked him not to meet the crown prince of Saudi Arabia for his alleged role in the murder of Khashoggi.
" The SNJT denounces the visit of Bin Salman to Tunisia as he is considered a danger on the security and peace in the region in the region and the world as well a true enemy of freedom of expression" The Statement added. 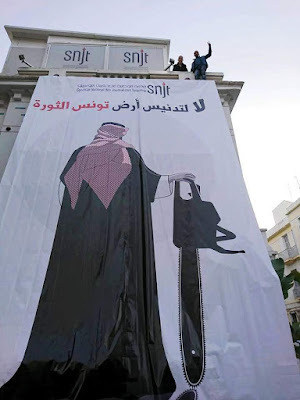 The SNJT did not stop at that Open letter or the fact it put up a very big banner of MBS depicting him carrying around a saw saying that he is not welcome in Tunisia, it also organized a conference for it and other 15 NGOs and unions in the country declaring their rejection for the visit on Monday. 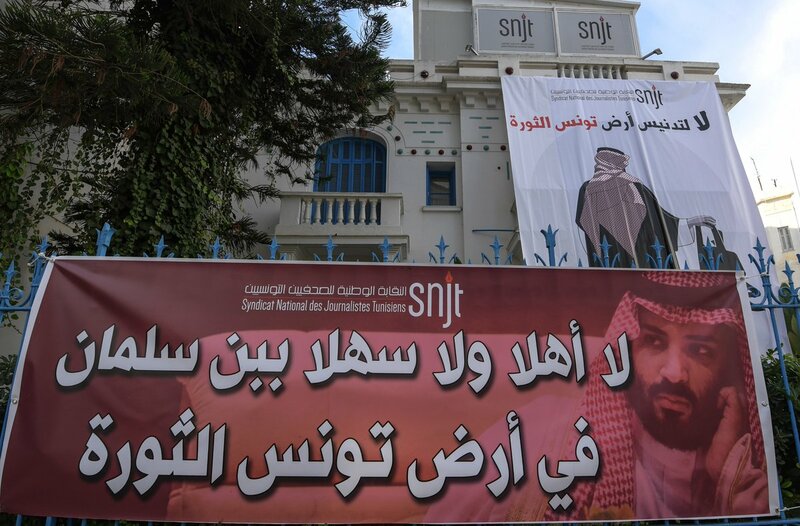 On the same day, SNJT announced that it filed a lawsuit against MBS for crimes against humanity in Yemen aiming that the Tunisian prosecutor would file a lawsuit accordingly at the International Criminal Court against the Saudi prince in an unprecedented move !! The SNJT is not the only party or entity that filed a lawsuit against the man who hailed to bring reform to the conservative kingdom from a couple of months again in the West, not less than 50 Tunisian lawyers filed a lawsuit based on Jamal Khashoggi's murder to stop his visit to their country. "I do not know if they are able to do this according to the law in the first place but the message is clear"
Another 13 NGOs including Association Tunisienne Des Femmes Democrates "The Tunisian association of democratic women" issued a statement denouncing and rejecting the visit. Association Tunisienne Des Femmes Democrates also put up that banner on its headquarters in Tunis. 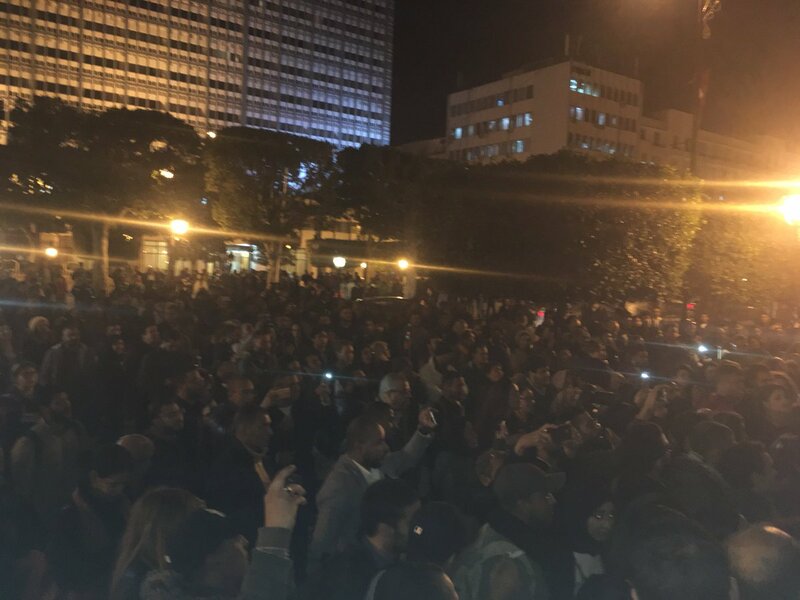 "Association Tunisienne Des Femmes Democrates's Facebook"
Monday evening, hundreds of Tunisians protested against MBS in the famous Bourguiba Avenue in the capital. There are unconfirmed news reports that MBS canceled his visit to Tunisia. I wish that this is true. 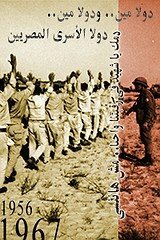 Either way, the civil society in Tunisia proved it is a beacon of hope in the Arab world.